The next evolution of the electrical grid is not so much of a physical change, but one related to the re-introduction of competition on the retail side of the electrical markets. 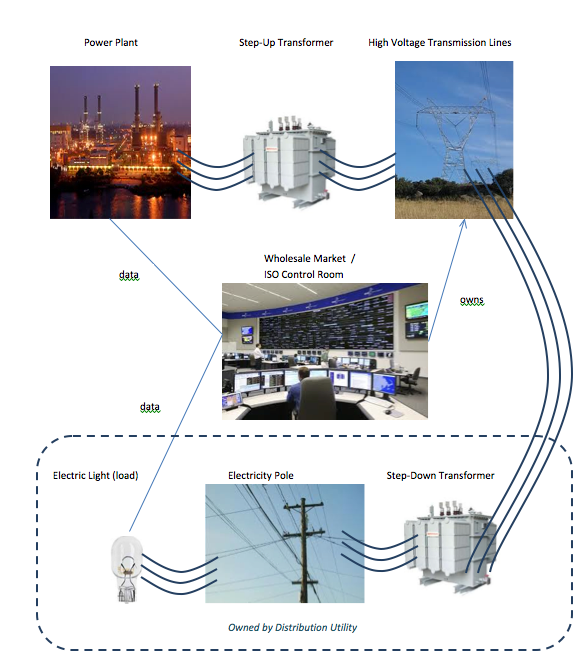 In the electrical industry, the wholesale side of the electricity markets refers to the generation of electricity through the wholesale electricity trading markets operated by the ISOs / RTOs. The retail side of electricity is the interaction between this entire system and the end customer or user of electricity. This evolution in the electrical grid is commonly referred to as Electricity Choice. Think back to how the electrical grid original developed back in the late 1800s. Competing companies would run their electrical lines to your building, and you could choose which of these companies from which to purchase electricity. With these companies competing for your business, this kept the price for electricity low. But, since each of these companies installed wires to your building, the companies were duplicating these fixed costs of serving customers. This also led to densely populated areas having many electrical companies to choose from (because a since run of electrical wire could serve many customers) and rural areas having no electrical service at all. The evolution to Electricity Choice came based out of an understanding of the economic concept of natural monopolies, and an understanding that the entire electrical grid was not a natural monopoly. Let’s look at the natural monopoly pieces of the electrical grid. Any time you’re running electrical wires, putting up electrical poles, and building sub-stations, it does not make sense to build multiple of these to serve a given area. The most economical way to build the system is to build a single electrical grid that can serve all customers. Since this is a natural monopoly, this remains the regulated side of the electrical industry. 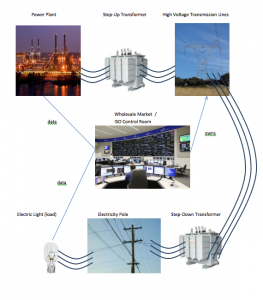 There are two types of entities that remain regulated in the electrical grid – the ISOs and RTOs that operate the transmission grid, and the distribution utilities that operate the local distribution grid. ISOs and RTOs are regulated at either the federal level (FERC – Federal Energy Regulatory Commission) or at the state level. (The ISO or RTO falls under federal jurisdiction if their transmission lines under their control cross state lines.) Distribution utilities are regulated at the state level. The new companies that you’re seeing in deregulated or Customer Choice markets are called Retail Electric Suppliers or RESs. (In New York, they’re called Energy Services Companies – ESCOs and in Illinois, they’re called Alternative Retail Electric Suppliers – ARES.) Retail Electric Suppliers supply you with electricity. They buy electricity on your behalf from the power plants, or wholesale markets and use the wires owned by both the ISOs / RTOs and the distribution utilities to deliver the electricity to you. Retail electric suppliers typically fall in one of two camps – either they own their own power plants or they enter into contracts for a certain amount of electricity to be generated by a power plant, or group of power plants. They buy electricity from the power plants on the one side, and deliver them to their customers on the other side. Forget the guys on Wall Street, these are the real “power” brokers. So why do we want to have competition in electrical markets? This goes back to our understanding of economics. The retail electric suppliers are competing against each other for your business. So, they’re going to try to out-do the other guy so that you pick them. If all you care about it price, they’re going to compete to see who can get you the best price. But is the value of having suppliers compete only related to lower prices? No. A competitive market will also lead to more options and more choices for customers. What if you only want to purchase renewable energy? If there are enough customers (demand) who want renewable energy, one of the retail electric suppliers will figure out how to supply you with that option. (It’s Econ 101 rearing its ugly head again – supply and demand.) But, what if I want renewable energy at a reasonable price? That can be done too. Competition in the electricity markets is going to provide customers with more choices and more options. That’s going to require you to make some decisions about your electricity. And to do that, you’re going to need someone like Power2Switch to provide you with the information to make the best decision for you. (It’s a shameless plug, but hey, after sharing the entire history of the electricity industry with you, I think I’m allowed one.) And who knows, these competitive markets may even spawn new products that we’ve never even though of. Prepare to have your mind blown! There’s a ton of challenges and a ton of opportunity in the electrical markets. As more renewables come on-line, the intermittency is challenging the command and control nature of the current grid. Also, with the rise of distributed generation, the centralized grid is under assault. It’s not all bad – these new technologies have the ability to solve some of the electrical grid’s most vexing problems. Stay tuned next week where I look into my crystal ball and try to predict the future! Let's do this again...Free Electricity For A Year!